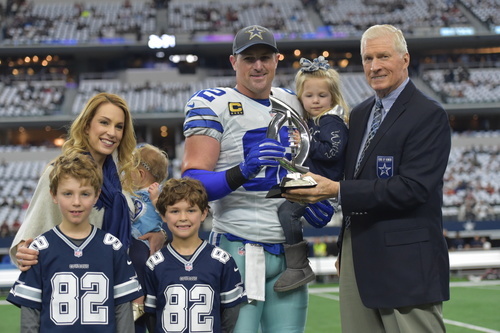 Witten joins six other inductees for the HOF’s annual induction banquet and reception sponsored by Texas Farm Bureau Insurance. WACO, Texas (Jan. 23, 2019)—The Texas Sports Hall of Fame in Waco will induct 11-time NFL pro-bowler Jason Witten into the distinguished hall of sports legends on March 30. As an Elizabethton, Tennessee native, Witten played collegiate football at the University of Tennessee, where he earned honors such as USA Today’s Player of the Year and All-American as well as being the runner-up for the “Mr. Football” award. In addition, Witten was Academic All-SEC conference as he led the conference’s tight-ends in receiving and reception yards. After his college career, Witten was drafted to the Dallas Cowboys, where he grew close with Tony Romo and was eventually named NFL All-Rookie in his first year of playing professionally. Witten created his legacy as a legend in football that may never be matched. Throughout his career, he caught 1,152 passes for 12,448 yards and had 68 touchdowns. At the time of his retirement from professional football in 2018, Witten ranked fourth on the NFL’s All-Time reception list and second among tight ends, behind Tony Gonzalez. In addition, he ranks at number 21 on the NFL’s all-time reception yardage list. Witten also holds several NFL records, including most receptions in a single season by a tight-end with 110 receptions and most catches in a single game by a tight-end with 18 catches. His game day legacy for the Cowboys includes the record for receiving yards at 12,448 yards and most receptions in a single game with 18 receptions. He also holds the record for most consecutive games as a starting player with 229 games, most consecutive seasons with a reception touchdown scoring with 15 seasons and most games played in Dallas Cowboys history at 239 games. Witten is tied with Dallas Cowboys legend Bob Lilly for the franchise record in Pro-Bowl selections with 11 selections. He was named All-Pro twice in 2007 and 2010. The only time Witten missed a single game in his 14 years of playing professionally was when he suffered from a broken jaw. Witten and his wife Michelle also founded the Jason Witten Score Foundation, which seeks to prevent domestic violence and they remain heavily active in the foundation today. In addition, Witten created the Jason Witten Collegiate Man of the Year Award, which is presented to a Division 1 college football player who demonstrates a record of leadership with their team by exhibiting exceptional courage, integrity and sportsmanship both on and off the field. He was also named the Walter Payton NFL Man of the Year in 2012. He currently serves as an analyst for ESPN’s Monday Night Football program. Witten will be one of seven inductees honored at the Texas Sports Hall of Fame banquet on March 30. He will be joined by the family of former Tennis legend Maureen Connolly Brinker (deceased), former Houston Texas Wide Receiver Andre Johnson, former professional basketball star Nancy Lieberman, former University of Arkansas Outland Trophy winner Loyd Phillips, former University of Texas and MLB pitcher Greg Swindell and former Texas A&M and NFL kicker Tony Franklin.